Amidst the ongoing agitation against the Citizenship Amendment Bill (CAB) that is now raging through the entire North-eastern region, a new front seems to be opening in Manipur — the Meitei population. Earlier, the state had been paralysed for more than a year over the demand for the extension of the Manipuri variety of the Inner Line Permit which is not as envisaged by the Eastern Bengal Frontier Provinces Act 1876 that requires special permits for the rest of Indians to visit the states of Arunachal Pradesh, Mizoram and Nagaland. The first bill passed by the then Ibobi Singh-led Congress government was rejected by the Centre. When in 2016 the BJP-led government under N Biren Singh came in, a new bill christened as the People’s Protection Bill was passed in 2017 and and forwarded to the Centre where Home Minister Rajnath Singh has been sitting on it since. The once majority Meiteis of Manipur’s rulers at the zenith of their powers had their suzerainty spread from the banks of the Chindwin river in Myanmar to that of the Surma river in present day Bangladesh. As early as 1776, the then East India Company had entered into a treaty with its rulers. But all that underwent a sea change when the Government of India had in 1949 coerced the then ruler of the State to sign a merger agreement of Manipur with the Union of India. Around that time a Central delegation of Captain Williamson Sangma and Gopinath Bordoloi had visited Manipur to determine the future of the Meitei people of Manipur – as to whether they would like to be included in the list of scheduled tribes of India. They met three Manipuri gentlemen namely G.Lalita Madhav Sharma, G. Bangka Behari Sharma and Sinam Keishna Mohon Singh, the so-called scholars of that time who asserted that the Meiteis being Hindus by religion would not like to be classified as a scheduled tribe. However, the Meitei Chakpa community who were then classified as untouchables because of their refusal to become Hindus were classified as Scheduled Castes. The same was not true for the Tripuris of Tripura who had opted to be classified as scheduled tribes including their ruling class. However, the hill communities belonging to a varied number of tribes came to be classified as Scheduled Tribes and were given constitutional protection as regards lands and reservations. Thus, it is that the tribal population controls 90 per cent of the total geographical area of Manipur and no Meitei can buy land there while the reverse is not true. Also, their assembly constituencies are classified as reserved constituencies meaning nontribals cannot stand for elections from there. Trouble began long back around 1709-1748 when King Pamheiba aka Garibniwaz was ruling Manipur. He came under the influence of a Bengali Hindu missionary by the name of Santidas Gosai who convinced Pamheibato convert to Hinduism and make it a state religion. Pamheiba went one step further and had all the pre-Hindu Meitei historical manuscripts called Puya burnt in a ceremonial manner. The forced conversion into Hinduism was however limited to the Meiteis or the plains settlers only and excluded the various hill tribes with which the Meities always had fraternal ties considering that they had all descended from a common ancestor. Then the Hindu system of sacred and profane seeped into the psyche of the neo-converts amongst the Meitiesand they began considering the tribals as profane. However, the Meities although converted into Hindus did not abandon their pre-Hindu tribal customs and practices. They maintained the worship of Sanamahi the ruling deity and till today follow the practice of burying the placenta of every new born – whether born in hospitals or not – on the right side of the house if a boy and on the left side if a girl. They continue to perform the Lai Haraoaba festivals or the worship of the forest spirits. These pre-Hindu rituals are followed by the Manipuri Brahmins who came along with the new religion from mainland India and married Manipuri women and got themselves assimilated amongst Meitei society although they follow an endogamous system of marriage. Thus, anthropologically speaking although the Meities are classified as Hindus, it is a very different form that is practiced here. There also exist a sizeable portion of Meiteis who follow the original form of Sanamahi Laining. It was actually this latter group that had first raised the bogey of being classified as a scheduled tribe some 30 years ago, but it fizzled out then. But by 2012 a definite form was taken and the Scheduled Demand Committee, Manipur (STDCM) came into existence and began with a memorandum submitted to the Governor. By 2013, the papers had started reaching Central leaders and soon the Central government wrote to the State government asking for the ethnographic and socio-economic survey reports of the Meitei people for consideration of their being included in the list of scheduled tribes of India. However, for the last few years, the government of Manipur had been sitting on it neither rejecting it nor giving a reply. Then the movement started gathering momentum and in May 2016, over 6,000 people gathered at the Iboyaima “Shanglen” and a high-spirited discussion followed. During the discourse it was pointed out that the Meitei people today faced extinction being hemmed in from all sides and nowhere to go except for the five districts in the valley. It was iterated that the only constitutional means left to safeguard the people and their land was to be classified as a Scheduled Tribe under Article 5 of the Constitution. That was also the time when the State was burning with valley people demanding the Inner Line permit to stem the tide of outsiders from mainland India in Manipur. The non-likelihood of the Government of India giving assent to the bill was pointed out as it goes against the fundamental rights of Indian citizens to settle anywhere in India. 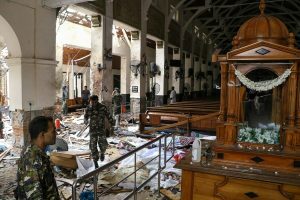 Further if such an Act was agreed for Manipur then other states like Maharashtra where animosity towards outsiders is perhaps more than in Manipur would be impacted. The bill was returned to the State from the Home Ministry for reconsideration and the movement was back at square one. 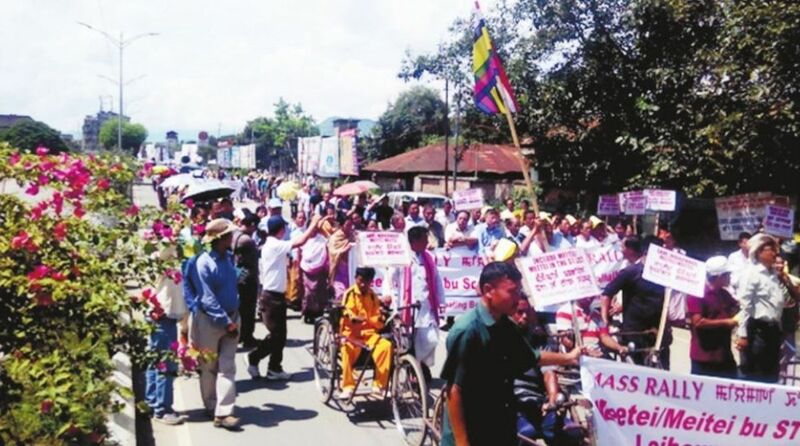 Then on 18 September 2016, supporters of the Scheduled Tribe movement numbering more than 1.5 lakh people choked the streets of Imphal as they staged a rally reiterating their demand shouting slogans and holding placards. It was one of the biggest rallies Imphal had witnessed in recent times. The State government pretended not to see it and did not issue a single statement. The movement did not lose its momentum as its volunteers fanned out to the countryside and interacted with numerous intellectuals, social activists and political leaders and obtained their viewpoints endorsing the demand. On 13 January this year, the STDCM held a public meeting entitled “Meeyam Gee WarrepLoubaNumit” meaning Public Decision Day. It was mentioned by various speakers that during the last meeting held with the government in 2017, it was mentioned that the State administration was only being requested to forward the plea for reservation to the Centre as they are the final decision-making body in this regard. However on 13 January, the leadership of the STDCM seemed to have ran out of patience and declared that unless the State Government sent the recommendation they would immediately halt the construction of the railway lines to Manipur as it was deemed to be the carrier of people from the mainland who would soon swamp the valley and wipe out the population. A general strike was also called whereby it was stated that even airlines would not be exempted. A panicky Biren Government soon sent a letter to the leaders of the STDCM calling for talks. During the meeting, Chief Minister Biren is said to have assured that he will consult all the MLAs in his government and take his Cabinet colleagues in confidence and pass a Cabinet resolution to the effect and forward the same to the Centre. He urged the leaders to withhold the general strike to which they agreed. In the meantime, the All Tribal Students Union (ATSUM) issued a fatwa to all tribal legislators and bodies directing them to stand against the demand of the Meiteis for inclusion in the ST list. They termed the Meities as high-castes Hindus of India and as such they did not qualify to be classified as STs. This is inspite of the clarification issued by the STDCM that the existing quota of Manipuri tribals with the Manipur government would not be encroached upon nor would their lands which constitute 90 per cent of the total geographical area of the State. The best reply to their assertion was given by the Democratic Students Alliance of Manipur(DESAM) who urged their tribal compatriots to let the Government of India decide on the matter as it lies in their domain. CM Biren skipped his 30 January meeting as he had to rush to Delhi following the CAB row. Then he met the STDCM on 6 February again and this time the leaders told him that the Meitei community had never stood against the numerous MOUs signed between the Government of Manipur and various tribal bodies. Biren seems to have got the point clear and loud again and assured the delegation that he would consult and convince their leaders. A Cabinet decision can be arrived at through circulation and he called for another meeting on 24 February. But if no tangible solution is found by 24 February, Manipur may soon witness another long spell of curfews, bandhs and violence. For the Meiteis believe it is the survival of the future generation that is at stake.